Chainpure another famous village for kukris has their own style and distinction. Chainpure village in Eastern Nepal, another famous place for making kukris is where this kukri comes from and takes its name also. The kukris from Chainpure are slightly different than the other village kukris. This kukri has a solid wood handle for better grip as there are no brass fittings at the end of the handle. 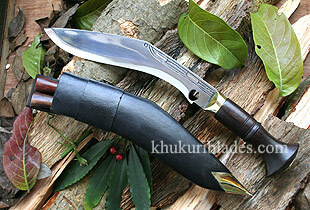 This kukri will also have a different kind of knotch than the other kukris. The open knotch which is meant as blood dripper is now closed for Chainpure kukris as this kukri for the people of this village is only a tool not a weapon. It also symbolizes the footmark of a cow which is holy and sacred in Nepal. Some Chainpure kukris are decorated with beautiful wooden scabbards also.